Alexandros Lappas, a chemical physicist and Research Director in the Institute of Electronic Structure and Laser (IESL) at FORTH, will be supported by the Fulbright Foundation under their 2016-17 Visiting Scholars program (www.fulbright.gr) with the purpose to lecture and conduct research in the United States. As a Fulbright Fellow, Dr. Lappas’ mission will integrate research activities at the Condensed Matter Physics and Materials Science Department at Brookhaven National Laboratory with the purpose to understand the physical and chemical interactions imparting improved functionality in energy materials. The scientific developments will be further used as a bridge to interface his expertise to students’ professional training at the Physics Department in Stony Brook University. The award, received after evaluation and recommendations by the U.S. Peer Review Committee and the Board of Directors of the Fulbright Foundation in Greece, recognizes “the grantees on the basis of their academic excellence, educational and professional achievement, civic engagement, leadership potential and character”. Dr. Lappas’ Fulbright award will support his research aiming to elucidate exotic states where charge carriers move without electrical resistance (cf. superconductivity) through a terrain of interacting magnetic dipole moments. 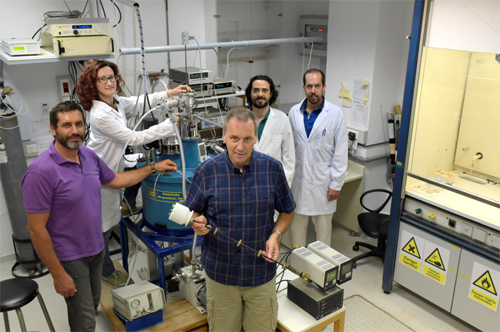 A surge of interest on this topic has been seen recently with the discovery of superconductivity in chemical compounds made with iron, a naturally occurring element found in a plethora of everyday applications. Dr. Lappas’ project, entitled “Deciphering complexity in novel molecule-intercalated iron chalcogenide two-dimensional materials”, proposes to investigate model compounds in order to unravel aspects of the competition of magnetism and superconductivity, an open challenge, mutually interesting and important for the Condensed Matter Physics and Materials Science communities. The studies will exploit unique total scattering methods, where monochromatic photons (synchrotron x-rays) and particles (neutrons) will test models where local structure fluctuations are fundamentally important for discovering smart energy materials. The latter, offer environmentally friendly opportunities to engineer components for an efficientelectric power transmission grid,while additionally fueling economic growth, and provide employment opportunities. At IESL-FORTH, Dr. Lappas’ work focuses on the synthesis of functional, quantum complex inorganic (nano)materials by chemical methods and the investigation of their intertwined structural and electronic state evolution. Complex metal oxides and chalcogenides made in his lab offer an extensive terrain of applications, ranging from data storage and catalysis to biomedical diagnosis and therapy, all enabled by strong couplings between properties such as short-range (nanoscale) fluctuations of the crystal structureand electromagnetic fields (funl.iesl.forth.gr/).